Samantha Cameron is the wife of former Prime Minister David Cameron. Samantha’s interest in Revitalise came about as a result of her having hosted a successful fundraising dinner for Revitalise at Chequers in November 2012. Revitalise gratefully accepted Samantha’s subsequent offer of patronage and she was officially announced as the new Patron of Revitalise during a visit to Jubilee Lodge on 2 July 2013. As well as Revitalise, Samantha supports a number of other charitable causes including Contact a Family and the Big Splash Trust. She is also Creative Consultant for the luxury accessory company Smythson Bond Street, of which she was formerly Creative Director. 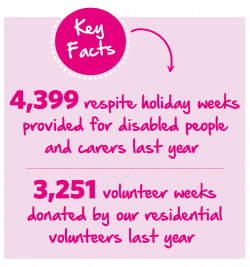 Revitalise is making a real, tangible difference to the lives of thousands of disabled people, carers and volunteers each year, through our respite holidays and unique volunteering programme.